AUTO TRANSFOERMER STARTER (ATS) Control Panel was used for operating submersible pump or other electric motors, &Especially for Rural agro electrical market. We can manufacture up 434 kW as per customer specification and design. We are using reputed brand switchgear and Motor Protection Device Like: Kaizen, Schneider Electric, BCH India, Siemens, L&T, Technic, C&S etc. Specification :( 1)Metal Box: CRC Sheet with Powder coated. (2) Digital Ammeter(R-Y-B). (3) Digital Voltmeter (0 - 500 Volt) RY-YB-BR. (4)Over Load Protection (As per Motor Rating) Variable with 0 to 60 Sec Time. (5) Under Load Protection (As per Motor Rating) Variable with 0 to 60 Sec Time. 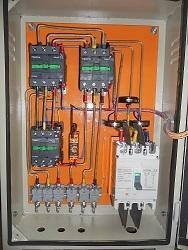 (6) Over Voltage Protection (300 - 500 Volt) Variable with 0 to 60 Sec Time. (7) Under Voltage Protection (300 - 500 Volt) Variable with 0 to 60 Sec Time. (8) Single Phase Preventer with Current and Voltage Sensing. (9) Switch - Auto-Manual. (10) Power and Control wiring: Cupper. (11) Out Put Terminals (As per Motor Rating). (12) Indicating Lamp: R-Y-B (22.5 sq.mm LED Type). (13) Push Button: On/Off (22.5 sq.mm LED Type). (14) Auto Transformer (Air Cooled various taping 60%, 70%, 80%). (15) Timer (16) Water Level Controller.